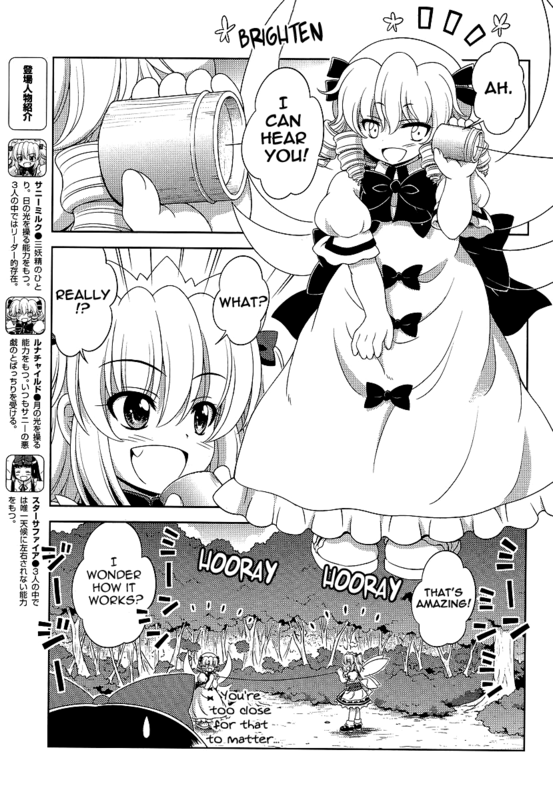 The following article pertains to manga that are part of the Touhou Project video game series. If you’re unfamiliar with it, you should read my Touhou Project Primer first. It’s best to play the games before taking in anything else. All of these are part of the Touhou Sangetsusei (東方三月精, roughly Touhou Three Fairies (Sun, Moon, Star)) manga series, the above titles basically operating as subtitles to separate the four “parts” of the series. All of the manga are pretty much the same, with the “major” changes between each part not being major at all. In fact, the change from Eastern and Little Nature Deity to Strange and Bright Nature Deity from a “story” perspective is nonexistent. On that note, let me actually explain what this series is. Touhou Sangetsusei is an episodic fantasy/slice of life manga series set in the universe of the Touhou Project video game series which follows the titular Three Fairies of Light (new characters expressly created for this series) as they play pranks on the residents of Gensoukyou, the world in which the Touhou Project is set. When they’re not playing pranks, they’re having silly and childish adventures or relaxing, and along the way the readers (and sometimes the fairies) gain more insight into and information on the paradise that is Gensoukyou. 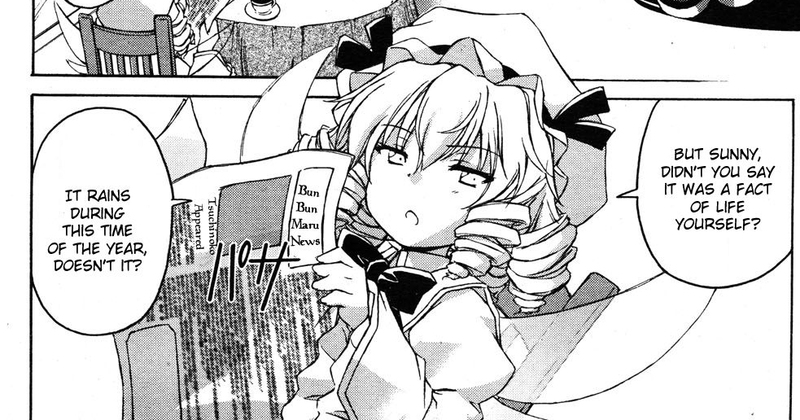 Touhou Sangetsusei is the author and franchise creator, ZUN’s, first attempt at making manga and it shows in a good way. ZUN is something of a Renaissance Man, solely responsible for the programming, music, writing, and art of the Touhou series mainline games. 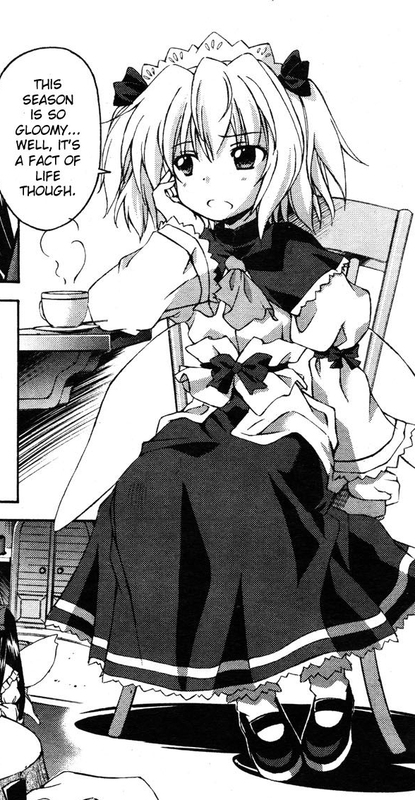 He cares a great deal about Touhou, and he clearly cared quite a bit about this little manga. While ZUN handles the writing, the art of the series is handled by Matsukura Nemu (松倉ねむ) for Eastern and Little Nature Deity and Hirasaka Makoto (比良坂真琴) for the rest (if you’ve heard of this manga, you probably recognize it by Hirasaka’s art). Furthermore, ZUN wrote an extra story titled Fairy of the Moon for the first volume with illustrations by Ayami Chiha (綾見ちは). And, speaking of extras, every volume release of Touhou Sangetsusei came with a new music CD composed by ZUN featuring a handful of tracks; usually themes based on the series’ main characters or on events that happened in the chapters of that volume. What’s more, ZUN along with Hirasaka (for sprite/portrait work) developed a game that’s spun off from the manga starring the famous fairy Cirno as the main heroine, fighting against the Three Fairies of this series for a foul prank they pulled on her. “Touhou 12.8: Yousei Daisensou ~ Touhou Sangetsusei”, or “The Great Fairy War ~ Touhou Three Fairies”, was released in August of 2010 with a charming story and some fun game mechanics unique to this entry alone. 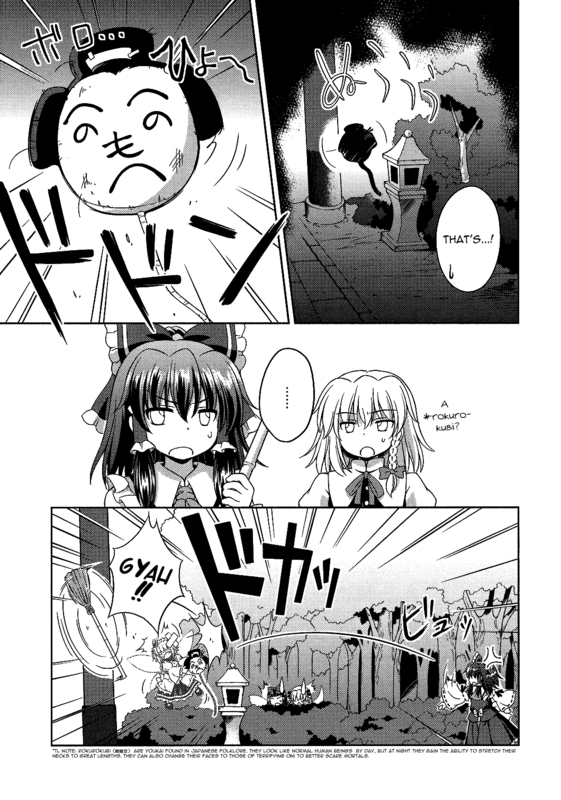 Overall, Touhou Sangetsusei is a rather special thing. 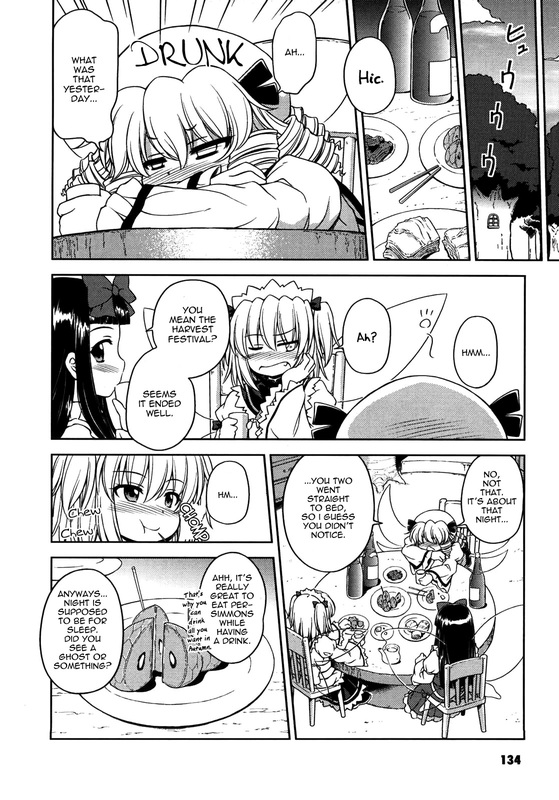 It’s a funny, adorable, ridiculous manga, and among the Touhou manga series, it is undoubtedly the easiest to get into, requiring no knowledge of the series to enjoy it (although it would definitely help, if only for some character jokes). and Star Sapphire, a star fairy with the power to “see” surrounding animate lifeforms. Sunny and Luna are strengthened or weakened by the presence or absence of their sources (the Sun or Moon, respectively), but stars are always out so Star is always at her best. The fairies are all idiots. Happy idiots, but nonetheless idiots. They’re mischievous, but largely innocent beings that are mostly just a nuisance, but they sure are cute, and in most cases harmless. Most fairies act on their own, only getting together when a powerful youkai is about, which hypes them up, agitates them, and makes them stronger (hence, they’re the common enemies in the game series). The Three Fairies of Light are a trio of fairies that have decided to always be together, shacking up in a tree and mostly using their powers to perform quiet and unseen pranks (or theft): Luna silencing their footsteps and voices, Sunny bending light to make them invisible, and Star keeping a lookout for anyone that might catch them. They are almost always just playing around, going on treasure hunts, catching rabbits, “solving mysteries”, or whatever else comes to mind. They also love to get drunk. They’re really old despite how they look, so remember, it’s okay! 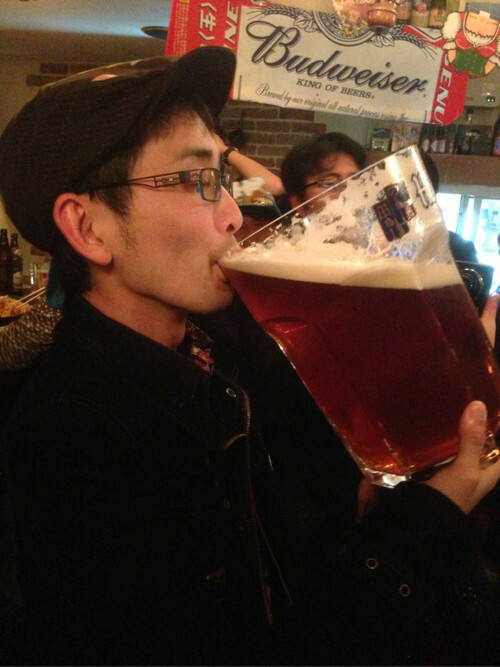 This is undoubtedly due to the preference of ZUN, who loves beer. There’s a lot of drinking in Touhou. Quickly describing the Three Fairies’ characters: Sunny often makes herself the leader, is lazy in the morning, but is otherwise generally hyperactive. Luna is quieter and seems more mature (enjoying reading and drinking coffee) but that’s mostly just her tastes. Also, she’s less likely to want to start trouble because she’s often left behind if things go awry, since she’s very clumsy. Star seems to be the one with the most common sense, not that she doesn’t say foolish things just like the rest. She normally looks very happy with everything, although she loves to shift work onto her two friends and will also abandon them early if trouble ever looms on the horizon (with her ability, she can literally see it coming). They’re great friends for the most part, but can all easily start tussling if instigated (like saying the Sun needs to beat the Moon on New Years — that’ll get them going). Again, they’re really just like foolish kids. It’s horribly cute and amusing. Wrapping up, I’ll mention how things change from series to series. First, there’s Eastern and Little Nature Deity, which I believe was going to become what Strange and Bright Nature Deity is, but the first artist had to leave the project due to health concerns. The series was about the same, just with a very different art style. A page from Eastern and Little Nature Deity, illustrated by Matsukura Nemu. The fairies have used their powers to make rain silent and invisible. I actually like it, however it’s a lot less refined of a style. Hirasaka’s art for the rest of the series is solid and very soft looking, which is relaxing and extremely easy on the eyes. Also, the translation you can find for the first volume of Eastern and Little Nature Deity is really dodgy for the first chapter and not hugely improved for the rest. 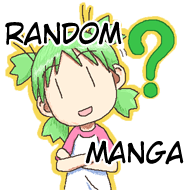 You may want to save this manga for reading after you’ve gotten invested in Strange and Bright Nature Deity (which is what I did, I actually wasn’t aware of the first manga). It’s up to you. You should read Fairy of the Moon before you reach the last chapters of Strange and Bright Nature Deity, though — it’s a story about Luna meeting a character introduced around then. Strange and Bright Nature Deity roughly culminates with the Three Fairies befriending Touhou deuteragonist, Marisa Kirisame, after courting her attention and impressing her a few times throughout it. Also, the fairies move into a new home. 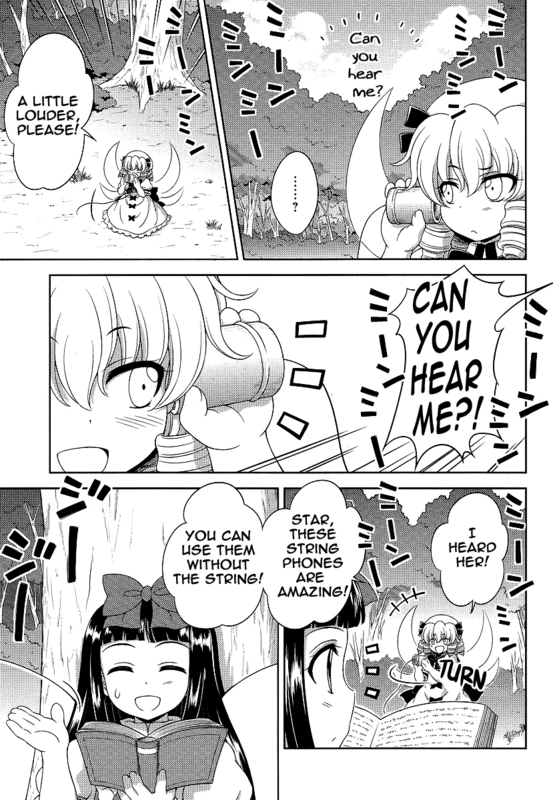 You could say the next manga, Oriental Sacred Place, is about the fairies attempting to do the same with Touhou protagonist, Reimu Hakurei. 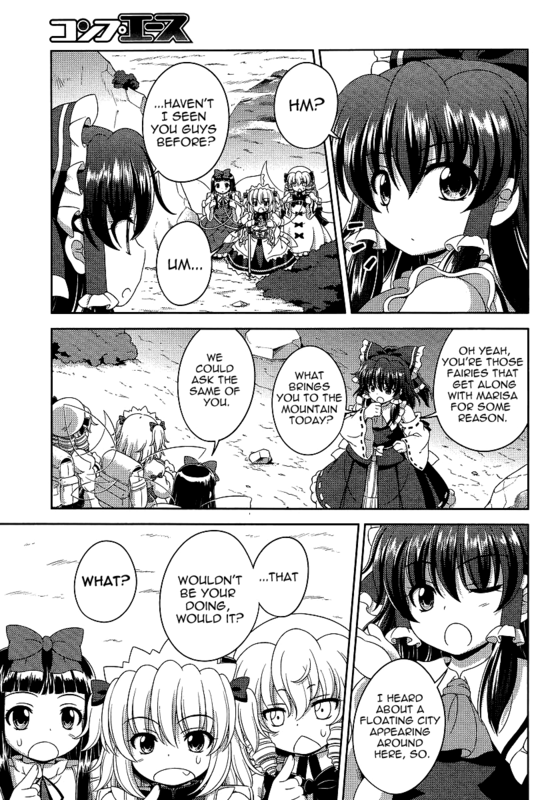 Marisa and Reimu tend to befriend youkai, whether they want to or not, after beating them for causing trouble in the game series. Since Marisa is an easy going ordinary magician, she doesn’t mind befriending the fairies early. 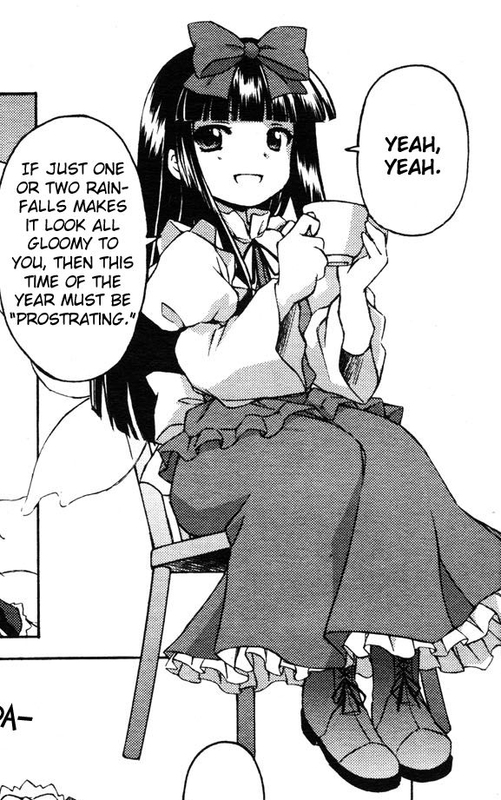 Reimu is a shrine maiden and basically the protector of Gensoukyou, charged with keeping it safe and maintaining the barrier that separates it from the “Outside World”. Her job is to stop youkai from causing trouble, basically, but she doesn’t even register fairies’ presence or identity most of the time (which makes sense, since in the games most fairies she encounters she just shoots down with her seals without a second thought). 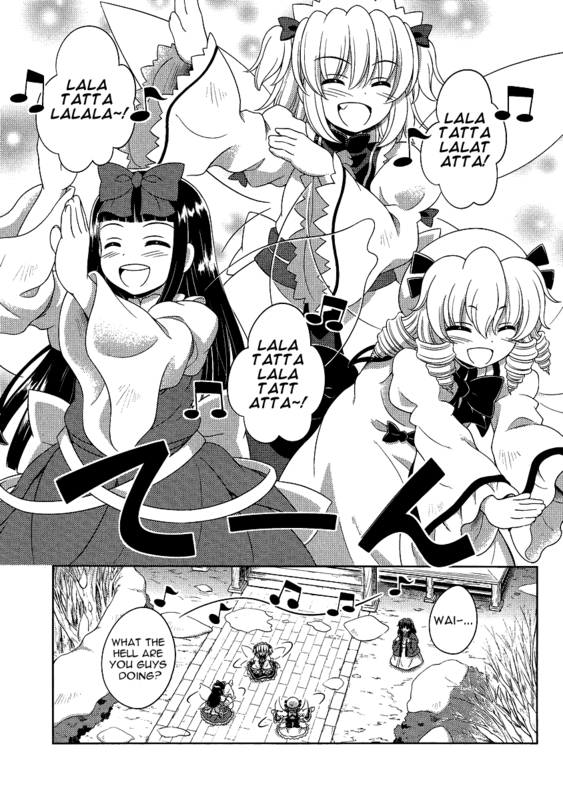 Wanting to be recognized/respected/liked, the Three Fairies earnestly try to rattle the shrine maiden. The series ended here originally, but four years later it started again with Visionary Fairies in Shrine, surprising and amazing literally everybody. It was even more surprising since this continuation introduced the notorious, infuriatingly difficult boss, Hell Fairy Clownpiece from the latest game (as of this writing) “Touhou 15: Touhou Kanjuden ~ Legacy of Lunatic Kingdom”, into the cast. I’ll let you see for yourself how that turns out. 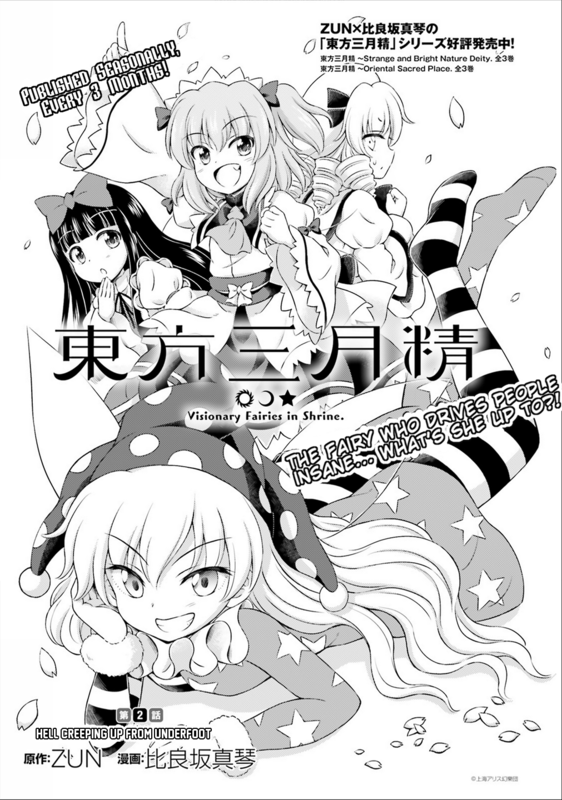 Visionary Fairies in Shrine is a quarterly manga, and is currently ongoing. And that’s about that. 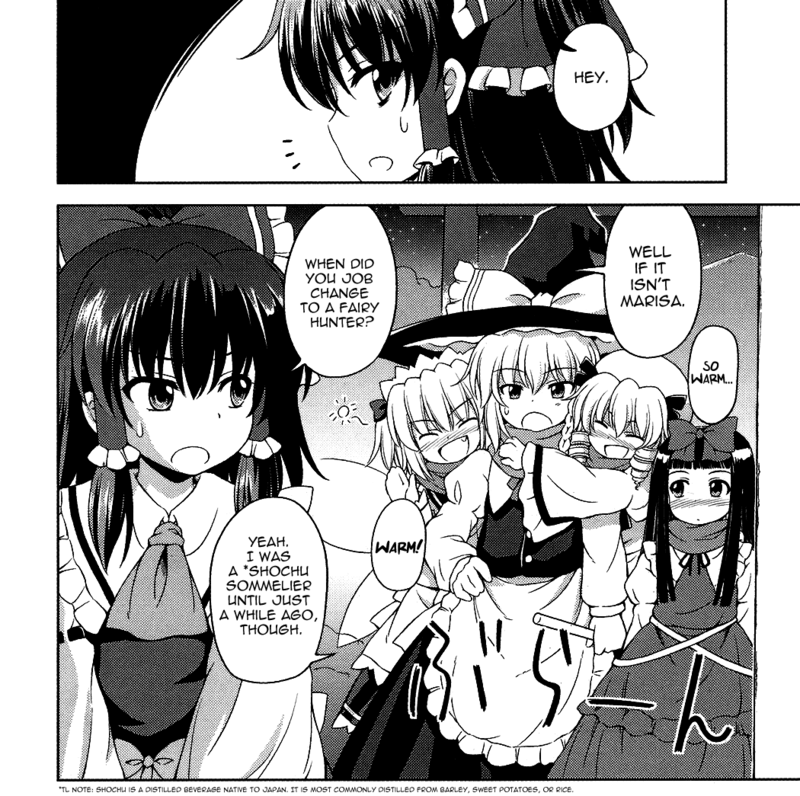 As a Touhou fan, I really love this manga. It’s pleasant, because you don’t get this kind of day-to-day stuff from the games, which focus almost exclusively on resolving incidents. 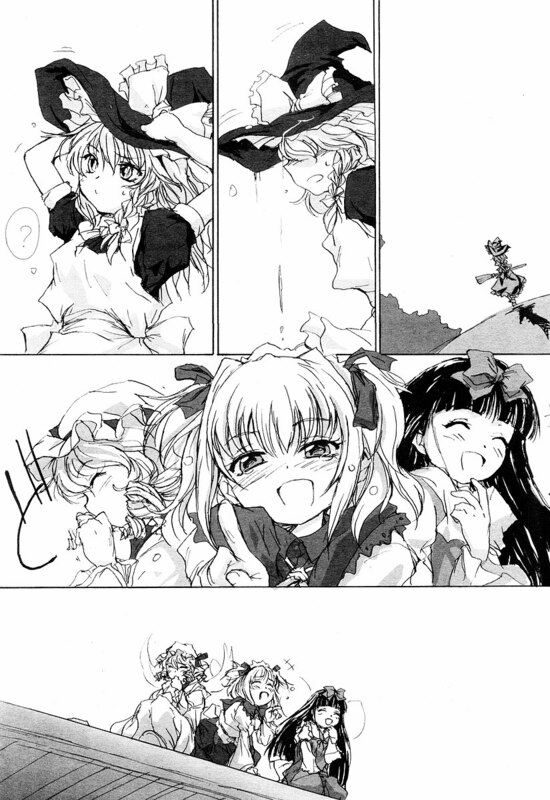 You get to see slices of Reimu and Marisa’s lives as well as the fairies, too, which is nice. If you haven’t played the Touhou games, you’ll probably still enjoy this, but I encourage you to play the games to increase your enjoyment. Thank you for reading. Later! 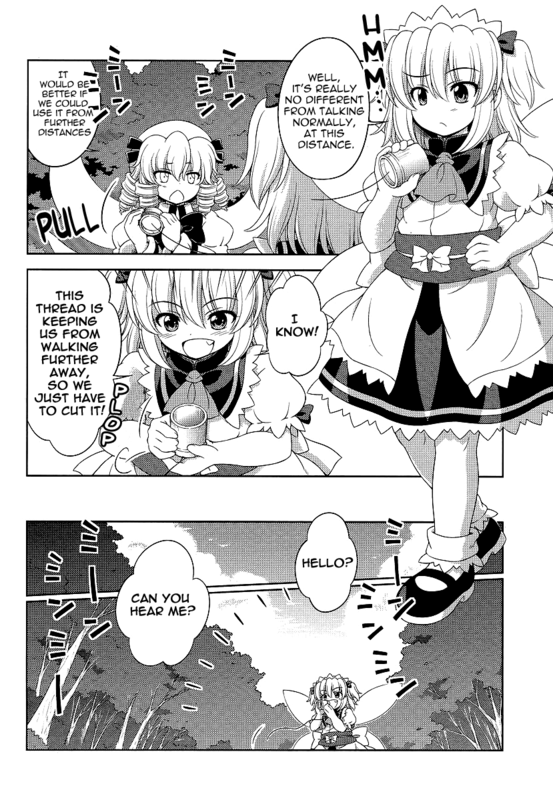 Touhou Suzunaan ~ Forbidden Scrollery. Touhou Ibarakasen ~ Wild and Horned Hermit.